There are those in life you hope you never hurt. Those who have walked with you through sacred space and have defined friendship for you. Some of my very favorite people in the world I have known since high school. These women,17 years of friendship, and thousands of memories have created some of my most treasured relationships. As teenagers, we couldn’t get enough of each other. Our parents would take turns hosting slumber parties, and feeding 6 growing young ladies. We were in each other’s classes, we sat by each other before school, during lunch, and took over the couches at each other’s houses after school. Sunday—church together; Wednesday night—youth group, church camp, mission trips, family vacations, we were in life together. In short, we were inseparable. The hours upon hours we spent together knit us together as a group, and my friendships with these particular women helped shape me into the woman I am today. Intertwined with the sweet, I can also identify the bitter memories. Flashbacks that remind me of when I did not act with kindness, or patience. When I tore at those who are my sisters in Christ. Proverbs 18:21(ESV) says, “Death and life are in the power of the tongue, and those who love it will eat its fruits.” My unruly tongue lashed out hurtful words. Language that caused heartache and tears. I am grateful that in these instances I was met with grace and forgiveness, and our solidarity endured. It’s scary that such a small muscle in our body, paired with the thoughts in our brain, can so quickly break down another human causing sometimes irreparable damage. Becoming aware of the power of my tongue presents a daily challenge. Do I build others up, or do I tear them down? Am I choosing to speak life-giving words into those around me, or am I squandering away my speech on gossip and folly? I am prayerfully examining my heart, and asking God to give me words of wisdom, truth, and healing. I will always be grateful for the beauty of the words that have been spoken to me by my girlfriends. 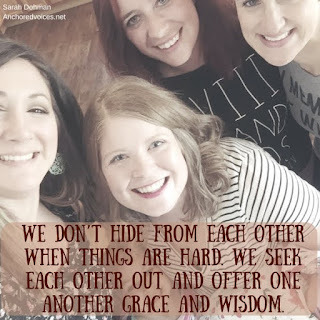 We have laughed together, prayed for one another, spoke truth into one another’s lives when we needed it, and offered the grace found in the truth that not one of us is perfect. We knew exactly how to build one another up, and spur one another on in our relationship with Jesus. United we lived out 1 Thessalonians 5:11,“Therefore encourage one another and build one another up”(ESV). Even today, we have a string of text messages filled with Bitmoji, funny quotes, prayer requests, and promising words. I have been given a group of women who are life-givers and truth wielders. I realize this is rare, and I am grateful. I also recognize that stewarding these friendships holds weight and brevity. 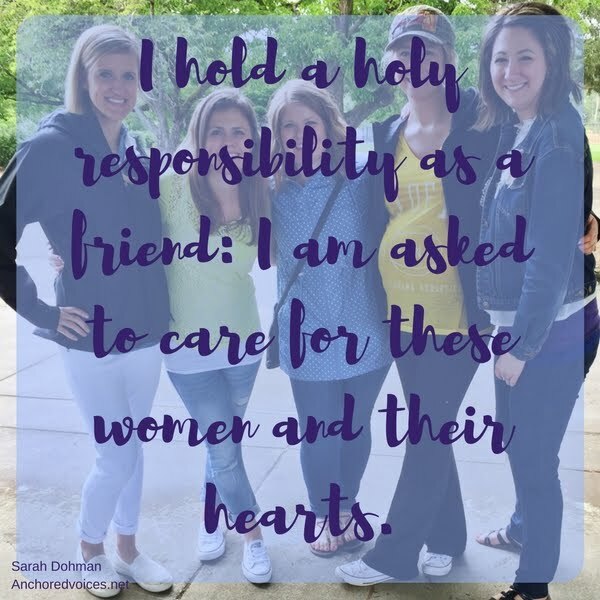 I hold a holy responsibility as a friend: I am asked to care for these women and their hearts with tenderness and attention to words that perhaps go unspoken. I allow myself to be vulnerable, and in turn ask that they do so as well. We don’t hide from each other when things are hard. We seek each other out and offer one another grace and wisdom. 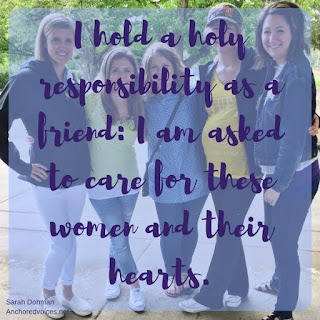 I am challenged and called to action when I think about my group of girlfriends. Can we cheer each other on, and celebrate the successes of the other as if they were our own? Can we hold our tongue when it is powered by our flesh instead of our spirit? Can we rest in our Savior trusting that He will give us the strength to be who He has called us to be? Will we have the courage to be aware of how our actions and words might impact the lives of others? I hope so, and I hope you will join me in the attempt. 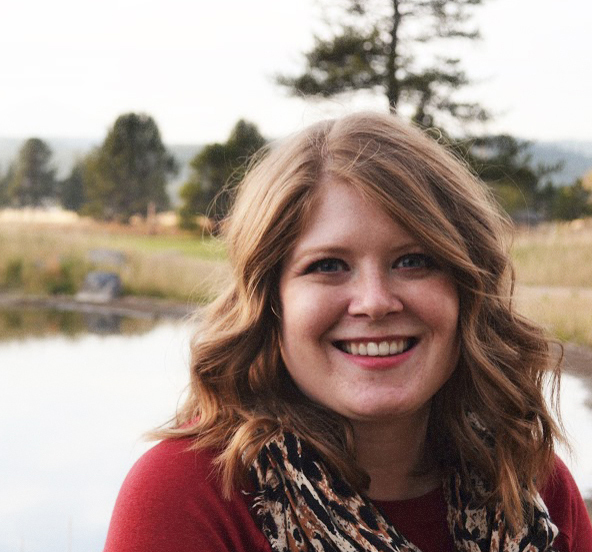 Readers, Will you join Sarah in the quest for speaking life instead of death?